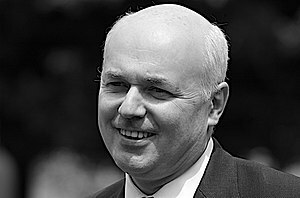 It’s not often I would identify myself with Iain Duncan Smith MP. I certainly can’t square the recent benefit changes with his alleged support for social justice and his country house home. He went to the Royal Military Academy at Sandhurst, but the only places I have visited at Sandhurst have been Marks and Spencer and Tesco. But I do share the odd trait with him. The politically aware among you may remember how there was a huge contrast in personality between himself as Leader of the Opposition and Tony Blair, as the charismatic Prime Minister. At the 2002 Conservative Party conference, Duncan Smith tried to make a virtue of the difference. “Do not underestimate the determination of a quiet man,” he said. Unfortunately for him, when he got to the House of Commons again, Labour MPs would put their fingers across their lips and say, “Shush” every time he got up to speak. His quietness was derided, and that has sometimes been my experience in the church as well: a quiet leader can be derided. Either people want a larger than life minister or you find you have consistently made the same point in meetings, only for people at future meetings of the same committee to say that something has not been addressed. There is no shouting, or aggression, let alone violence, that goes with true wisdom. It is quiet and gentle. It does not arrest you, it does not grab you warmly by the throat and shake you. It is the still, small voice of God. I have told before the famous story about the former Liverpool football manager Bob Paisley, who spoke very quietly at press conferences. One day, a journalist asked him why he spoke so quietly. “I speak quietly, so that you will listen,” he replied. Might it be that the words of wisdom are spoken quietly by God and by God’s people in order that we might listen? It would be nice and easy if wisdom were served up on a plate for us, brought to us by waiter service. But it isn’t. We have to go in search of it, tuning our ears in to its quiet sounds that frequently are drowned by the noise of sin in our world. That means God isn’t just going to splash his wisdom everywhere. Yes, it is available to all, but it will only be found by those who have a heart to search for it. We must want his wisdom badly – badly enough to set out on a quest for it, determined not only to find it but to put it into practice when we finally discover it. Now clearly some of this means we need to develop a dogged determination in our devotional lives to hear the voice of God. Yes, it does mean a regular commitment to a style of Bible reflection that is suitable to us. It does mean spending time in prayer. It does mean commitment to a small group as well as to Sunday worship, and so on. All these things I’ve mentioned before, and will continue to emphasise. It’s why I remain concerned at the findings of our worship questionnaire, where a number of people identified Sunday services as the only times they seriously engaged with the Bible. We just can’t do that and get away with it if wisdom is quiet. It’s no good giving up quickly on spiritual disciplines when we don’t immediately have a stunning experience of God. Like a lover, he woos us, but he also plays hard to get, because he wants us to be serious about him. A small bit of foolishness creates a big stink in society, says the Preacher, and fools parade their foolishness for all to see. It’s not hard to see that, is it? Some people seek the spotlight, but have very little of substance to offer society. Plenty of people who gain the dubious status of celebrity could fall into this category. Or we have people who become famous and are thrust into the limelight, simply because of their abilities in one particular field, and who are then labelled ‘rôle models’ by tastemakers and cultural commentators for some questionable reason. Footballers who end up biting members of the opposition might be included here. It’s hard to know who is the more foolish: those who deem footballers to be rôle models, or fame-hungry sporting stars who lack the wherewithal to set an example. When we live in a society like this, feeling outnumbered by a catwalk parade of idiocy, what are we to do? We bemoan the triumph of style over substance. We despair of how a little trivia becomes a major thing. Having spied the front page of a certain red-top tabloid this last week leading on the story of a boy band splitting up, because presumably they have a strong idea that is important to their readers, I share that same sense of exasperation. But it’s never acceptable for the Christian to give up in the face of a folly-ridden society. It remains our missionary call to keep speaking the wisdom of God, whatever the odds. After all, according to the New Testament, Christ is the wisdom of God, and how can we not speak about him? How can we not see all the more clearly our society’s need of Christ when we witness the epidemic of foolishness around us, and are struggling not to become infected ourselves? Ultimate victory belongs to Jesus. God raised him from the dead and made him king of the universe. Whatever direction things are going at present, that direction is only the short term. We know the long term outcome for all creation. We are on the victory side when we witness faithfully to Jesus Christ, the wisdom of God. The third and final picture of wisdom I want to share with you is this: wisdom is gracious, folly is wicked. his views on religion … are simplistic, ill-informed, and simply wrong. We are equally not exercising wisdom in the church when we use our knowledge or cleverness to put someone else down. We are using wisdom – the wisdom which ultimately is Jesus Christ himself – when grace is our theme and our motive. We show wisdom when we speak with grace about grace. It is surprising how often grace is excluded from Christian conversation. After the recent convictions of Mick and Mairead Philpott for the killing of six of their children, I saw within a short time on the Internet Christians putting messages that they longed for them to burn in Hell. Where is the grace there? It is as if what we really think goes something like this: we are good, other people are bad, and we will get to Heaven because we are good. Nothing could be further from the Gospel, yet this lie goes round in church circles. None of us would be here but for grace. The people we look down on in the church family are recipients of the same grace. The people in our society who commit terrible, yes, wicked acts, are in need of that grace. That grace is centred on the Cross of Christ. And the Cross is a divine foolishness that outranks human wisdom, according to Paul in 1 Corinthians 1. It is indeed the wisdom of God. We have said already that wisdom is a quiet voice and a minority voice. Well, nowhere more than here, where wisdom is characterised by grace is it a quiet, minority voice, even sometimes in the church. It is time to come back to the Cross, if we have strayed away. It is time to remember our experience of being humbled by love at the Cross. And when we recall our own humbling at the feet of divine love, then would it not be normal for us to begin extending that same grace to others within the church and beyond? In a few minutes, we shall come to the climax of this service in the central act of gathered Christian worship, when we take Holy Communion together. Let our eating of the bread and our drinking of the wine this evening remind us of the grace and love God poured out for us in his Son. Along with that, can we also recall that every Sunday is an Easter Day? Every week, the fact that the Christian church moved the Sabbath from Saturday to Sunday reminds us of the history-changing events we mark on Easter Sunday. God calls us back to that empty tomb constantly. For there we see the grace of God every bit as much as we do at the Cross itself. At the empty tomb, God by his grace and power transforms hope-drained people into hope-filled people. This is the source of our life, our life in Christ. I pray that it will feed us, and – through us – feed others, too. Posted on April 27, 2013, in Sermons and tagged Allan Bevere, Bob Paisley, Iain Duncan Smith, JLS, Luis Suarez, Richard Dawkins, Sandhurst, wisdom. Bookmark the permalink. 2 Comments. Strange to say, I have quoted Ecclesiastes 9:13-18 to several of the leading lights of the pro-life movement, or had in mind, when commending to them a tactical suggestion, connected with my comment recently on another of your blog posts. The role of the man, poor but wise, who saved the city, but was not remembered, is one I often been willing to take, though even my ability to play that role, depends on the platform being willing to listen to suggests from the floor. Wehad Ecclesiastes at our Wedding so it is full of Wisdom.It seemed a Strange choice but suppose that everything has a time.Would have liked Corinthians 13.